The Lily Guild creates beautiful, intricate and creative paper blossoms. 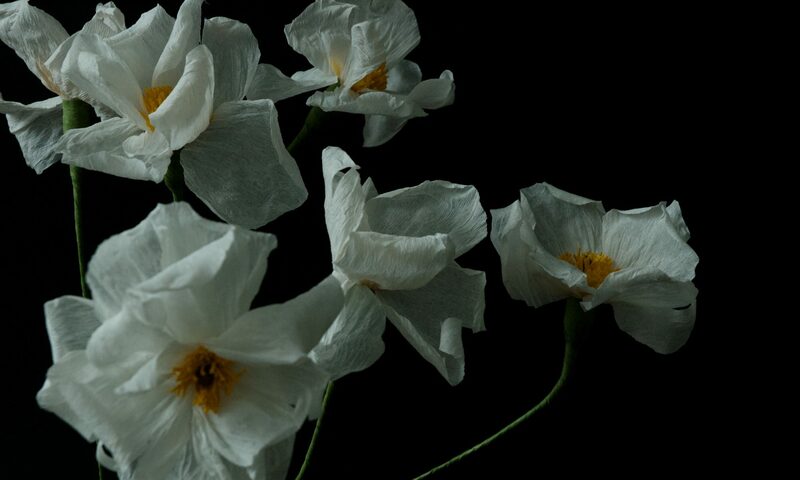 Each bloom is inspired by nature and translated into the language of paper with love and care. Blossoms are created with hand-dyed paper and assembled petal by petal. While ‘real’ flowers are beautiful and a feast for the senses, they contribute to many social and environmental problems. Pesticides and fungicides pollute the environment and endanger workers on flower farms. Flower transportation by airplane and truck emits tonnes of carbon, contributing to climate change. The water and chemicals and energy used to store and process flowers is truly staggering. And while they are seemingly indispensable for creating a beautiful and romantic mood, they inevitably end up in the garbage. Paper flowers are not only a viable alternative to ‘real’, they have a unique and special beauty. They are available in any colour, in any season. Imagine the possibilities. Each flower is inspired first and foremost by nature. The Lily Guild plays with texture, colour, and size, to create interpretations of nature’s perfection. Besides nature, Dominika is inspired by a vibrant community of paper flower artists scattered across the globe. The Lily Guild does custom work for unique individual looking for something a little out of the ordinary.